Predicting a snowstorm is a maddening game of three-dimensional chess. Snow requires sub-freezing temperatures in the lowest 1-2 miles of the atmosphere. Even a thin layer of milder air can spark a changeover to rain or sleet (ice pellets), keeping overall snow totals down. It looks like a surge of slightly milder air 5,000 to 8,000 feet above the ground will trigger an icy mix Thursday, from the Twin Cities to the Iowa border. Think of it as a sleet sandwich, starting as wet snow and ending as snow, with plenty of sleet sandwiched in between. Blizzard Warnings are posted west of MSP, and some 12-20 inch snowfall totals are likely over far western Minnesota, where a changeover to ice probably won’t happen. Throw in 40-50 mph wind gusts and you have all the ingredients for treacherous travel. The beauty (wrong word) of an April snowfall? The sun is too high in the sky for it to stick around for long. Skies clear Saturday with highs in the 50s next week. Whatever snow winds up in your yard (3-8 inches metro with the most in the far norther/western suburbs?) should be gone by Tuesday. Metro Snowfall Totals Trending Lower. NAM model guidance from NOAA (00z run) shows 4-8″ across the immediate metro, with well over a foot for much of northern, central and western Minnesota by Friday. With a changeover to sleet and freezing rain south and east of the Twin Cities now fairly likely, the solution above is more realistic. Map: pivotalweather.com. Icy Wild Card. Up to an inch of glaze ice close to the Minnesota-Iowa border? That may be a little extreme, but there’s little question southern Minnesota will see significant icing from freezing rain and sleet, especially late Wednesday night into Thursday. Peak Thursday Winds. I wouldn’t be surprised to see reports of 50 mph+ gusts near the Buffalo Ridge of west central Minnesota Thursday. Map credit: Praedictix and AerisWeather. European Model More Aggressive with Snow Totals. ECMWF doesn’t bring as much warm air aloft north, implying more snow and heavier amounts – the 12z European model stirll printed out 8-12″ for much of the Twin Cities metro area. Map: WeatherBell. Snow’s Last Hurrah? I may have said something similar a few weeks ago, so never mind. Suffice to say that temperatures rebound into the 50s next week. Just about all the snow that falls in the metro will be gone by Monday – it may take a few days longer over far western Minnesota. ECMWF: WeatherBell. A strong April storm will develop in the central United States over the next day or so, bringing the potential of heavy snow and high winds to the Plains and Upper Midwest. This system will bring a swath of heavy snow across parts of the Upper Midwest, with areas from north-central Nebraska across parts of South Dakota into western Minnesota potentially picking up over 18” of snow by the end of the week. Uncertainty in how much snow will fall exists for areas around Sioux Falls and the Twin Cities as snow could change over to rain, freezing rain, and sleet at times during the storm. As the storm strengthens in the mid-section of the nation, very strong winds are expected to develop, at times gusting over 40 mph in areas that see snow (and over 60 mph from Texas to southern Kansas). In areas that see snow, these strong winds will cause blowing and drifting snow as well as low visibilities and blizzard/whiteout conditions. Difficult to impossible travel conditions due to the heavy snow (potentially falling at 1-2” per hour rates at the height of the storm) and blowing/drifting snow. Power outages due to the wet, heavy snow as well as high winds bringing down power lines and tree branches. Blizzard Warnings are now in place this morning from Nebraska to Minnesota ahead of this storm, with additional Winter Storm Watches and Warnings from Utah to the upper peninsula of Michigan. Across parts of the southern Plains, High Wind Watches and Warnings are in place due to the potential of 60+ mph winds Wednesday into Thursday. There will also be the potential of quickly spreading wildfires across this region as well due to the gusty winds and available fuels. April Blizzard In The Upper Midwest This Week. A strong April storm will develop across the mid-section of the nation during the middle of the week, bringing impactful winter weather to parts of the central and northern Plains as well as the Upper Midwest. As this system forms and pushes east and northeast through the end of the week, a band of very heavy snow is expected to form north and northwest of the low from Wyoming into the western Great Lakes. At times, snow within this band is expected to fall at a rate of 1-2” per hour, especially Wednesday Night into Thursday across the upper Midwest. Strong winds are also expected to form across the central United States, which will help to cause whiteout and blizzard conditions. We will also be watching a zone where precipitation could be in the form of rain, freezing rain, snow, and sleet at different times during the storm. That right now is expected to set up somewhere near the Sioux Falls and Twin Cities areas, meaning overall confidence in snow totals in those areas are low. Denver, CO: Winter Storm Watch from Wednesday afternoon through Thursday morning for 4-6” of snow and wind gusts to 50 mph. Cheyenne, WY: Winter Storm Warning from Noon Wednesday to Noon Thursday for 5-8” of snow and wind gusts to 40 mph. Casper, WY: Winter Storm Watch from Wednesday morning through Wednesday evening for 6-9” of snow and wind gusts to 40 mph. Goodland, KS: Winter Storm Watch from Wednesday evening through Thursday afternoon for 2-9” of snow, a light glaze of ice, and wind gusts to 65 mph. North Platte, NE: Winter Storm Watch from Wednesday evening through late Thursday night for the potential of blizzard conditions with 4-12” of snow, ice up to two-tenths of an inch, and wind gusts up to 50 mph. Valentine, NE: Blizzard Warning from 1 PM Wednesday to 5 AM Friday for blizzard conditions with 10-22” of snow, a light glaze of ice, and wind gusts to 50 mph. Rapid City, SD: Winter Storm Warning from 6 AM Wednesday to Noon Thursday for 8-15” of snow and wind gusts to 40 mph. Pierre, SD: Blizzard Warning from 1 PM Wednesday to 4 AM Friday for blizzard conditions with 10-20”+ of snow and wind gusts to 55 mph. Aberdeen, SD: Winter Storm Watch from Wednesday afternoon through late Thursday night for the potential of blizzard conditions with 3-10” of snow and wind gusts to 45 mph. Sioux Falls, SD: Winter Storm Watch from Wednesday evening through Friday morning for the potential of blizzard conditions with 6”+ of snow, ice up to a quarter inch, and wind gusts to 50 mph. St. Cloud, MN: Blizzard Warning from 7 PM Wednesday to 7 AM Friday for blizzard conditions with 12-20” of snow and wind gusts to 50 mph. Minneapolis/St. Paul, MN: Winter Storm Watch from Wednesday evening through Friday morning for 6-12” of snow, ice up to a tenth of an inch, and wind gusts to 50 mph. Duluth, MN: Winter Storm Watch from late Wednesday night through Friday morning for 9-15” of snow and wind gusts to 45 mph. Eau Claire, WI: Winter Storm Watch from Wednesday evening through Friday morning for 3-6” of snow, ice up to a quarter inch, and wind gusts to 50 mph. Wausau, WI: Winter Storm Watch from Wednesday evening through Thursday afternoon for 4-6” of snow, up to one-tenth of an inch of ice, and wind gusts to 40 mph. Marquette, MI: Winter Storm Watch from late Wednesday night through late Thursday night for 5-10” of snow, ice up to one-tenth of an inch, and wind gusts to 35 mph. Heavy Snow Potential. A band of wet, heavy snow is expected to fall from parts of Wyoming into the western Great Lakes through the end of the week, with the heaviest amounts falling from north-central Nebraska across parts of South Dakota into western Minnesota. In that defined area is where snowfall tallies of at least 18″ will be possible in some locations. There will be a sharp cut-off line on the north and south side of the system, with totals quickly decreasing from plowable to potentially little more than a nuisance. On the south side this cutoff will be prominent as snow will chance to rain, freezing rain, or sleet at times throughout the event. This sharp cutoff line is expected to be close to areas like Sioux Falls and the Twin Cities at the moment, so confidence in overall snow totals in these areas are low. Note: snow will continue into Friday morning across portions of the region. Ice Potential. Along that rain/snow line we will watch the potential for accumulating ice at times Wednesday through Thursday. Areas where ice accumulation is expected to be the heaviest will be across parts of central Nebraska and from southwestern Minnesota/northwestern Iowa into Wisconsin where ice totals of 0.15-0.25” will be possible. Strong Winds Leading To Blizzard Conditions. As the system strengthens across the central United States, winds will increase across the region, with gusts of 40-50+ mph possible. These strong winds would blow the snow around, leading to significantly reduced visibilities (and blizzard conditions in some areas) with very difficult to impossible travel conditions expected. These strong winds will also bring the potential of power outages. Strong Winds In The Southern Plains. This strong storm will also produce gusty winds across parts of the Southern Plains Wednesday into Thursday. Wind gusts over 60 mph will be possible. These strong winds will have the potential to cause driving issues, blowing dust, flying debris, and power outages. There will also be a high fire danger risk due to the strong winds and fuels that will be receptive to fire growth. High Wind Watches & Warnings. Due to the expected high winds from Kansas to Texas and New Mexico Wednesday into Thursday, High Wind Watches and Warnings have been issued. 57 F. Twin Cities maximum temperature on Tuesday. 55 F. average high on April 9. 38 F. high on April 9, 2018. April 10, 1977: A record high of 86 is set at Redwood Falls. 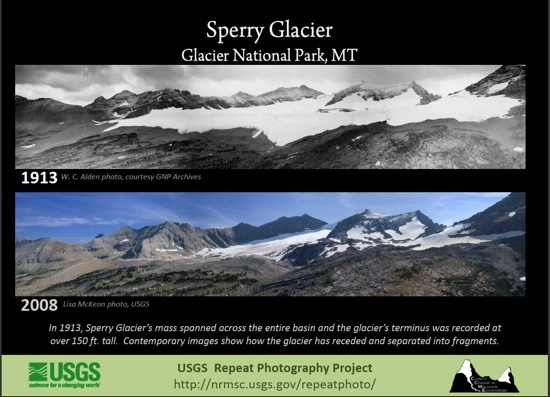 Boulder Glacier Montana photos: left (1932) right (2005) courtesy of USGS. Bye, Glaciers: Climate Nexus has headlines and links: “Earth’s glaciers lost nine trillion metric tons of ice between 1961 and 2016 and may disappear completely in some areas by 2100 if current warming continues, according to new research. A study published Monday in the journal Nature finds that glacial melt has contributed to an inch of sea level rise over the past fifty years. “Under current loss rates we are going to lose glaciers–basically all glaciers—in several mountain ranges,” lead author Michael Zemp told reporters.” (AP, CNN, USA Today, Mashable, National Geographic).